Remove the opamps and install the new opamps--careful attention to pin #1 orientation,,in the case of the dogs,,pin 1 corresponds with the "b" in browndog.The adcom opamps were marked with a notch of sorts denoting the pin #1.I would suggest installing the DIP 8 sockets, then you have the ability to roll opamps like tubes,if you prefer. Next you want to install 120uf/25 volt electrolytic caps to serve as local power supply reservoirs. the positive lead from the cap goes to pin 8(opamp) and the negative cap lead to pin 4.Then connect the remaining + and - leads on the caps,and tie them to ground.I ran a wire fron the caps which I mounted on the underside of the board to the ground of the power supply,which is easily distinguished. 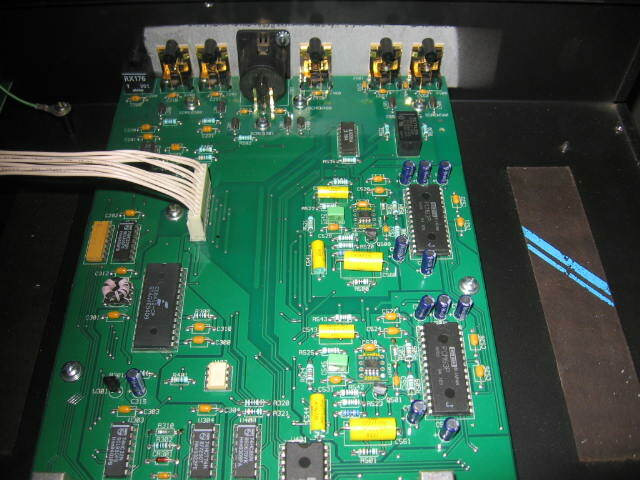 Remove the ferrite inductors at L 500 & L501nand replace with "jumpers",, as they might hide the opamps "flavor" if left in place. Remove the caps @ C 550 & C 551--nothing goes back there. I replaced the .1 uf bypass caps(not a requirement) and replaced with Digikey part # P4525ND .1 uf/50 volt stack metal film caps. Next replace the two .1uf caps C122 & C 123 with 22uf/25 volt cpas,this will increse the ripple rejection. Now you are done,, and prepare yourself for some sweet,detailed,and involving analod sounding digital tunes. There are some film caps in the analog section that are easily identified and labeled,,should not make much of a difference,,but since Sonicap has a sale,,I'll replace them next week,,what the heck. I give all of the credit to Fred Thompson,who helped me patiently via e-mail,,he answered all of my questions,and made the suggestions,,so,a Big Thank you to Fred,,for without his help,I would not have been able to complete this mod. Cost--less than 200 dollars(I'm including the sonicaps) which are optional,and would drive the cost down to about 110 dollars. Pic 3 shows the new opa's installed. Looks like some real nice execution after a long bit of research. Great Job! Pioneer Kuro 50" Plasma, Phillips Pronto Control w/Niles HT-MSU. Thanks George, please PM again with regards to getting those extra caps you have. Also I was confused with the highlighted part. What is this in reference to? Are you saying C550 and C551 have a bypass cap? Awesome can wait to get going on mine. Next you want to install 120uf/25 volt electrolytic caps to serve as local power supply reservoirs. the positive lead from the cap goes to pin 8(opamp) and the negative cap lead to pin 4.Then connect the remaining + and - leads on the caps,and tie them to ground.I ran a wire fron the caps which I mounted on the underside of the board to the ground of the power supply,which is easily distinguished. Do you have a photo of this with the wire routing, etc? You say caps? How many? H9-- the caps that I replaced(.1uf) are the opamp bypass caps,,it's not mandatory,,I just had the spare caps,so I replaced them,,I have 4 set aside for you,,along with some others. Looks good George. I cant wait to hear it. Aren't these replacement caps polar, or do I need NP. I purchased Digi-Key part # P11213-ND and these are definitely polar. Should I get something else? IIRC I ordered non- polar for this specific applicarion. Although I am told that the polarized caps will work. But where to put +? All other polar caps are + to the left, is that the correct way? I dunno,, but I'll find out,, are you that far along? George have you replaced the tiny yellow mylars around the Op-amps yet w/the Sonic caps? It appears to me the holes in the PCB are too small for the leads on even the smallest Sonic Caps and can't be drilled easily because the traces are so close together. Does this look like it might be an issue? Getting ready to start to get a parts list together for this and I want to take adv of the Sonicraft sale, but if they don;t work then I don;t want to be stuck with them. I should have them this week(sonicaos)-- I'll let you know the moment I find out,,I was thinking that the leads on the smaller sonicaps would be smaller in diameter,, guess we'll see. My bud who helps me with these mods suggested this: If the new leads are too large in diameter to fit in the PCB holes, clip the old caps as close to the body as possible leaving a small part of the old lead in the PCB. That way you have something to solder the new lead to. Does this look like you. This sounds like THISnow, I can't wait for the burn-in. The hardest part of the whole thing was getting the old caps out Took more time than anything else. I also broke the little wire for the "lock on" light in front. I was trying to get it back in and it pulled right out. I have no idea how much impact the sonicaps made, you'll have to tell me. I can't even describe what I am hearing. Familiar music just doesn't sound so familiar any more. The detail and low end are the biggest impact that jumps out to me right now. These SDA 2's never sounded like this before. Thank you for making sure I understood about the wire jumping and where to put the caps on those op amps. It was nothing to do. Without you doing this mod first, I would never have heard this DAC sound like this. I knew I was always happy I had bought it new, but now it's a whole new piece of equipment. If you have one, do this mod. It really is pretty easy, and well worth it!!! The leads fit just fine. They are smaller on the smaller caps. 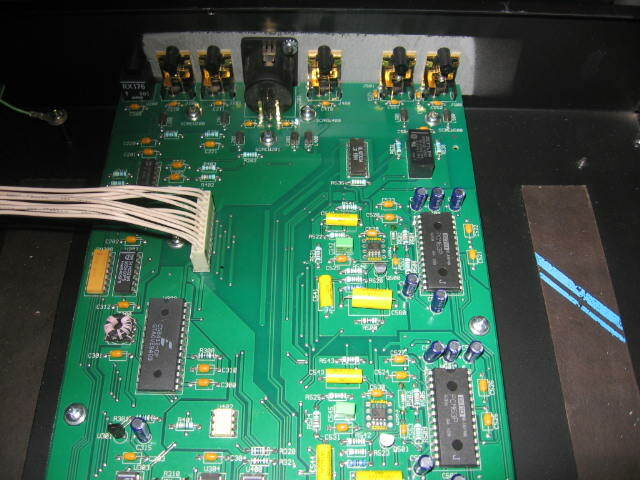 So you already replaced the yellow mylars around the op-amps with Sonicap Gen I's and the leads fit? Easily fit! Don't even worry about it. Just get the "Next you want to install 120uf/25 volt electrolytic caps to serve as local power supply reservoirs. 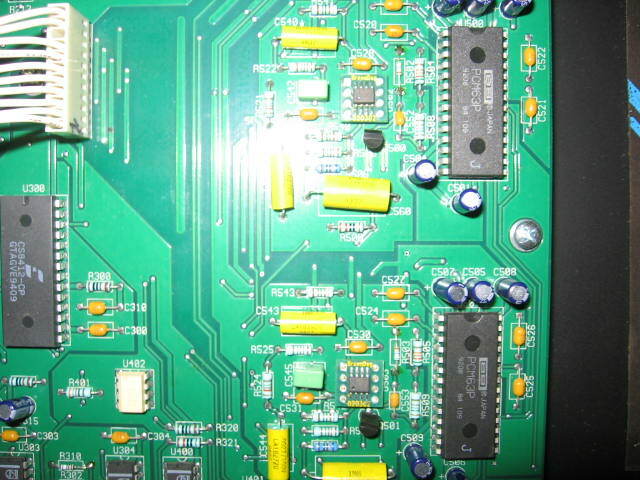 the positive lead from the cap goes to pin 8(opamp) and the negative cap lead to pin 4.Then connect the remaining + and - leads on the caps,and tie them to ground.I ran a wire fron the caps which I mounted on the underside of the board to the ground of the power supply,which is easily distinguished." part, which is easy, easy, easy. Please. Please contact me a ben62670 @ yahoo.com. Make sure to include who you are, and you are from Polk so I don't delete your email. Also I am now physically unable to work on any projects. If you need help let these guys know. There are many people who will help if you let them know where you are. No camera:D...guess it didn't happen:p I listened to Gary Numan - The Pleasure Principle this morning and then again after the mod:eek:something sure happened! Which Sonic caps did you order Gen I or Gen II? Trying to take adv of the sale which ends in a couple days. these are the values I need to replace the yellow mylars around the op-amps. are those the values you guys got? P.s. George I'll be sending a PM shortly with the info you requested. If anyone is interested, I have this DAC and im not currently using it. If anyone is interested, I would take 200 for it. Im sorry, 100 is just way too low for this dac. Its in perfect condition and the last two ive seen sold for 230 and 285.
sold for 150 dollars-- there is a Stan Warren modded one for 245,, good luck with your sale.BTW,, the way that you are approaching it(read the rules),is generally frowned upon here.I doubt that you will have any interest because your asking price is probabally too high. Good luck.